Babylon. Persia. Assyria. Jerusalem. Antioch. 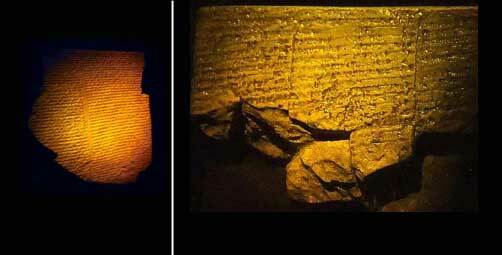 These 3D laser holograms of ancient Biblical artifacts document the historical events of the Holy Bible. Hello. 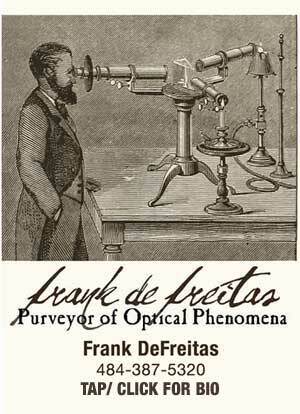 My name is Frank DeFreitas and I had my laser and holography studio in Allentown, Pennsylvania for 35 years (now retired). I was joined in the lab in collaboration with my wife Deb with all aspects of the production of these holograms. NOTE: This web page contains 2D *photographs* of the holograms. The photos will not be 3D on your computer screen. One must view holograms in person to appreciate their dimension and realism. 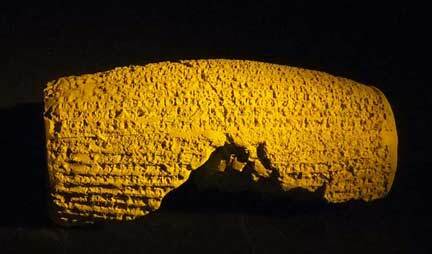 The Cyrus Cylinder. The clay cylinder is inscribed in Babylonian cuneiform with an account by Cyrus, king of Persia (559-530 BC) of his conquest of Babylon in 539 BC. He describes measures of relief he brought to the inhabitants of the city, and how he arranged for the restoration of temples, and organized the return to their homelands of a number of people who had been held in Babylonia by previous kings. Although the Jews are not mentioned in this document, their return to Jerusalem to rebuild their Temple (following their deportation by Nebuchadnezzar), was part of this decree. Cyrus also restored the treasures of the House of the Lord which Nebuchadnezzar had taken to Babylon. See: 2 Chronicles 36:22-23; Isaiah 44:28; Ezra 1:7-11. As for the holograms, no other media in the world can match the three dimensional, high fidelity images of REAL laser holography. Holograms provide a nano-resolution, ultra- realism that is unequaled with any other 21st century imaging technology. Holograms provide a way to accurately "duplicate" whatever has been recorded, as if the object were right in front of you. A Nobel prize in physics was awarded to Dr. Dennis Gabor in 1971 for his work in what would become known as holography. It is interesting to note that this entire project was carried out in a small town in Pennsylvania, USA, by a husband and wife team. Nearby towns are named Bethlehem, Nazareth, and Emmaus. For over 35 years, our laser and holography studio was in the stone root cellar of our 19th century house (total darkness, steady temperature and no vibrations are important when making holograms). All of the equipment was designed and built by hand. People from all around the world have visited to see, and to learn, about this Do It Yourself science and technology wonder. As a truly "mom and pop" project, we are relying on old-school word of mouth: if you find this project interesting, please share this web page with others. These ancient artifact holograms are created from originals whenever possible, along with museum-grade recreations from the finest prototype technologies in the world today, including depth-mapping and 3D printing. These ancient objects are associated with both the Old and New Testament eras, and each has a story of its own to tell. Before technologies such as holography, one would have to travel to many museums around the world in order to see these objects for real and in person. But now, though holography, they can be viewed in 3-dimensions, all at once, and all in the same place -- any place -- wherever a small display area can be provided for the holograms. THE PROCESS: Any object, anywhere in the world, can be holographically recorded directly on location; or scanned with lasers, with the resulting 3-dimensional data used to physically recreate that object via modern 3D printing technologies. Once this new physical 3D model has been manufactured, it is then recorded as a laser hologram. The added benefit of the extra step of holographic recording is to store the physical 3D object onto micron-thin 2D media ... therefore the 3D object no longer contains its physical mass, but is still 3D. It exists only as its original optical wavefront. In theory, an entire museum can be carried around in a shirt pocket. The Great Chalice of Antioch. The church at Antioch dates from 41 A.D. It was there that the followers of Jesus first became known as Christians, and for many years missionaries were sent to preach the gospel. With the fall of Jerusalem, Antioch became the main center of Christianity in the east. The inner bowl of the chalice may have been brought from Jerusalem, where it may have been the very vessel used in apostolic times by the infant church. The vessel is an open-work container of silver, bearing what is believed to be the earliest known portraits of Christ and his Disciples. It is 7.56 inches high, standing on a pedestal and holding a cup which would contain about two quarts of liquid. This cup, too, is of silver, and is a Jewish Passover bowl of great antiquity, identical with those used when Christ was alive. Several timelines suggest that in 30-47 A.D. Peter conceals the Passion relics in Jerusalem; 47 A.D. Peter brings the Passion relics to Antioch; 47-357 A.D. The Church of Antioch conceals the Passion relics; 1910 Archaeological discovery of the Great Chalice at the ruins of Antioch's ancient cathedral. Attempts to discredit began immediately upon its excavation at Antioch. Today it is considered to be a "standing lamp" from the 6th century, despite previous authentication by world-renowned experts. 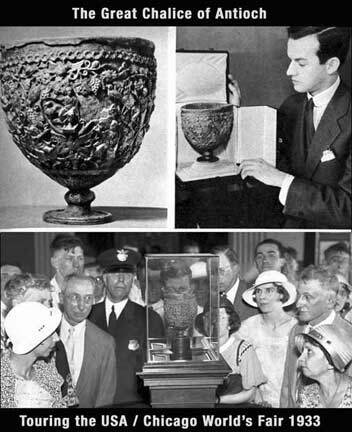 The debate continues, but regardless of it, the Great Chalice of Antioch remains a treasured example of early Christianity and Byzantine artisan silverwork that was once considered the true "Holy Grail" (exhibited as such at the 1933 Chicago World's Fair: A Century of Progress, and at the Franklin Institute in Philadelphia in 1936). Considered the oldest Christian relic in the world today. Believed from the 1st century. Carvings depict the life of Christ. 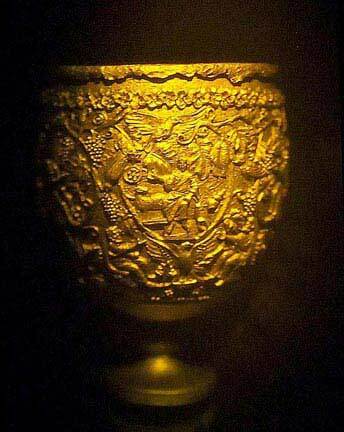 Inner cup believed by some experts to have been at the Last Supper. Its date, and even authenticity, is being challenged today. "There are science people that do not care for my latest work, because their minds are closed to religion. There are religious people that do not care for my latest work, because their minds are closed to science. Thankfully, there are many people around the world who have the ability to see and accept my work as both. They help me to get out of bed each morning." 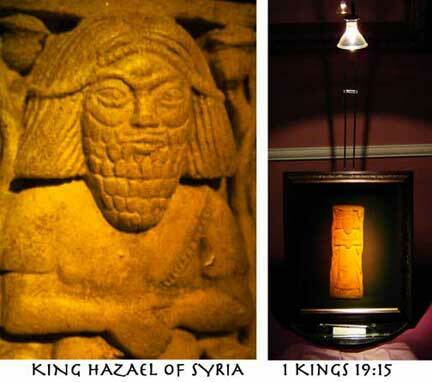 3D laser holograms can bring these ancient Biblical artifacts to people here in the USA, and throughout the world, that would never have the opportunity to experience them otherwise. Objects from many different museums can be combined into one exhibit, and travel anywhere in the world, with no fear of damage or theft to the original objects (which never have to leave the museums). Multiple copies of holograms can be made, and multiple exhibits can be displayed, all at the same time. It is a great way to see and experience history ANYWHERE at ANYTIME with ANYONE on Earth. Lasers and holograms are the emerging technologies of today's youth. In 35 years of being a holography "road man", I have met with, and presented to, hundreds of thousands of adults and students. The reaction of crowds that gather to see holograms on display is something that one must experience first hand. Doing a Biblical series of holograms has the potential to grab and hold the interest of today's youth like no other media. In fact, no display of any type on Earth can compare to seeing a 3D laser hologram in person. These particular holograms combine both their amazing imagery with their associated (and documented) Biblical events, thereby increasing Biblical literacy. I would like to take this opportunity to also mention that I often think of the future when it comes to laser communication, holograms and preserving our Christian heritage. One day we *may* find humanity leaving our home planet Earth to begin colonies on the moon and planets ... just as our ancestors left their home countries to travel to the Americas. Holograms can provide a way to take and display Biblical history at these future planetary outposts in space. Far fetched? Possibly. Today however, Deb and I are showing how it can be done ... by actually doing it ... with emerging technologies such as 3D laser holographic imaging and free-space laser based communications. Great Flood Tablets. Many people today have been (mis)led to believe that the Biblical account of the Genesis flood was "borrowed" from what is known as the Epic of Gilgamesh, and other ancient, non-Biblical flood stories / accounts from the Babylonians. However, unless I'm mistaken, the world's oldest known flood tablet, CBM 13532, discovered in Nippur, Mesopotamia, purportedly dates from 2100-2200 B.C. ... hundreds of years *before* the Gilgamesh and other discovered tablets, and only a short time after the actual flood itself took place (2348 B.C.). In this, what would be the earliest historical written record, not one translated detail varies in any way whatsoever from the Biblical account of Genesis. Predictably, both the translation of the tablet, and the date of the tablet, are disputed. Therefore, after reviewing the written works of Herman Hilprecht, reading newspaper reports and court transcripts, I respectfully submit the following. 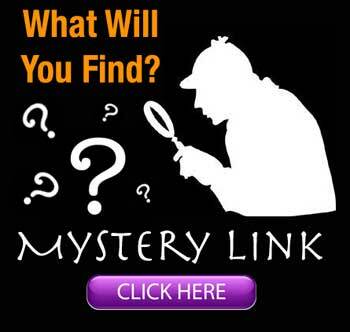 I cannot submit it as an archaeologist, nor as a Biblical scholar. I submit it solely as an independent principle investigator of this laser holographic project. 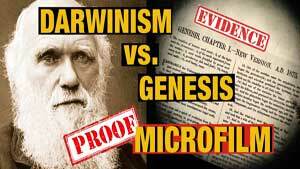 My conclusion is as follows: Those who have been convinced that the Noah flood story in the Bible was stolen from the Epic of Gilgamesh and various other Babylonian accounts have been grossly deceived by misinformation. It appears very convincingly to me that the Babylonian / Gilgamesh accounts were actually taken from the Biblical account of Noah, then changed to fit the Babylonian world-view of the day. Not the other way around. 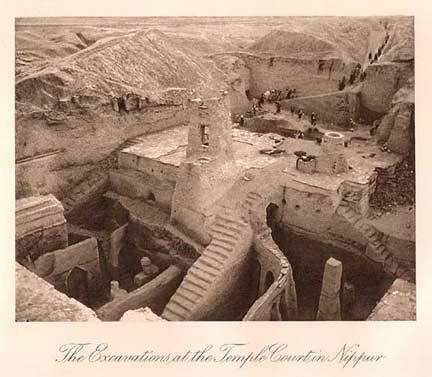 The excavations at the Temple Court in Nippur. 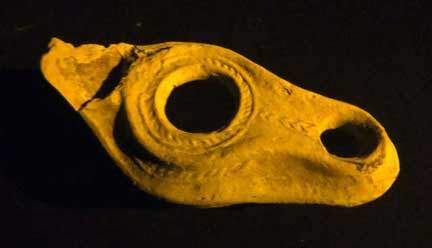 Archaeologists and researchers will continue to discover more secrets hidden beneath the earthen surface of the ancient world. This, my latest (and possibly my last) series of holograms provides a physical recorded glimpse into the history of many key events. 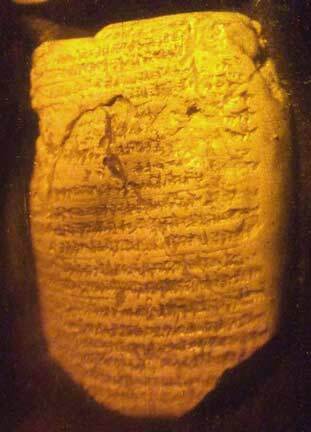 Babylon Chronicles Tablet. Translated in 1956, this tablet was found to be an historical account of events in Babylon from 605 to 594 BC following the collapse of the Assyrian Empire. The tablet is part of what is known as the Babylonian Chronicles. Nebuchadnezzar's army attacked Jerusalem and captured it on 15/16th March 597 B.C. Jehoiachin, the new King of Judah, was taken prisoner and removed to Babylon. This written record matches the account given in the Bible. See: 2 Kings 25:1-21. 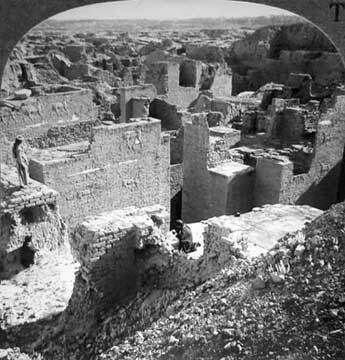 Excavations at the Palace of Nebuchadnezzar. Left eye view of an antique stereoview card, late 19th century. "When I look at my Biblical laser research, I know in my heart of hearts that its true "time" will not be for many generations in the future: when brave men and women will take the historical heritage of the Holy Bible and Jesus Christ with them to other worlds beyond Earth." 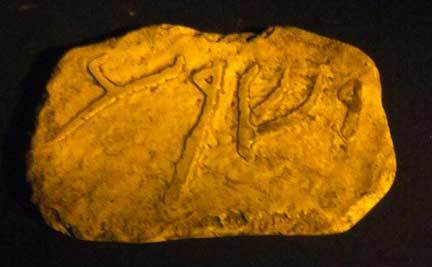 The Yeshua Stone. Yeshua is the original Hebrew-Aramaic proper name for Jesus the Nazarene as given by his parents. His full family name is considered to be "Yeshua Ben Yosef", Jesus Son of Joseph. The Hebrew pronunciation is Ye-SHU-ah, with the accent on the second syllable. The letters are read from right to left. Yeshua means "God's deliverance". 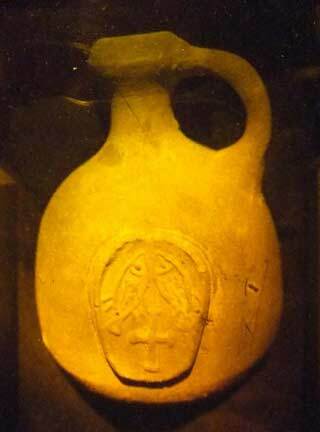 Recently, several clay jars have been found in Israel that have the name "Yeshua" inscribed on their lids. They date back to the 1st century AD, the era when Jesus lived.